WASHINGTON — The House Transportation and Infrastructure Committee late Thursday unanimously approved and sent to the full House the Surface Transportation Reauthorization and Reform (STRR) Act of 2015, a bipartisan, multi-year surface transportation bill to reauthorize and reform federal highway, transit and highway safety programs. 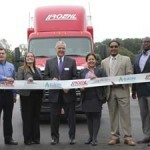 The passage drew positive response from several organizations, among them the American Trucking Associations, the Transportation Trades Department of the AFL-CIO, the Commercial Vehicle Training Alliance and NATSO, the national association representing truck stops and travel plazas. “Thursday’s actions by Chairman (Bill) Shuster, R-Pa., Ranking Member (Peter) DeFazio, D-Ore., and the rest of the committee were a positive step for trucking and for the country. While we’re anxious to see the funding portion of the bill, the roadmap laid out by this legislation is a good one for highway safety and efficiency,” said Bill Graves, president and CEO of ATA. 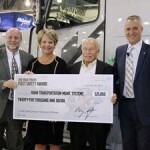 Don Lefeve, president of the Commercial Vehicle Training Alliance, said his organization applauded the committee for its commitment to ensuring that new drivers are able to access quality driver training and testing. NATSO President and CEO Lisa Mullings commended the panel’s work, but expressed concern with a provision that she said would amend the program commonly known as the interstate tolling pilot program. Meanwhile, the Coalition for Transportation Productivity (CTP), a group of nearly 200 of the nation’s top manufacturers, shippers, carriers and allied associations, expressed disappointment that the bill did not contain language allowing the use of 91,000-pound, six-axle trucks and sent a letter urging members of Congress to include that language when the bill goes to the full House. Truckload carrier executives had urged the committee not to include language in the bill that would allow twin 33-foot trailers on the nation’s highways, an issue that was never discussed when the panel took up the bill Thursday. The bill provides $325 billion over six years. FHWA funding is $242 billion, effectively flatline funding. The bill does not have a revenue title and revenue sources are yet to be identified. The bill modifies the Interstate System Reconstruction and Rehabilitation Pilot Program, which allows three states to toll an existing interstate. It requires a state to have enabling legislation before the pilot is approved. It imposes a three-year deadline for approval. The bill would require the Federal Motor Carrier Safety Administration to commission a Transportation Research Board study of the CSA program and carriers’ Safety Management System (SMS) scores. The study would evaluate whether SMS scores reliably predict future crash risk for motor carriers. It bill would require FMCSA to remove SMS data alerts, scores, percentiles and non at-fault crashes from public view until the study report and FMCSA’s corresponding corrective action plan have been published, and recommendations completed. Violations, measures and crash data would remain publicly available. Scores, alerts and percentiles would remain available to state and local agencies for enforcement purposes only, and could be made available to the respective driver or carrier upon request. Finally, FMCSA would be required to develop a program to recognize outstanding safety practices and to provide positive SMS points for investments in select, non-mandated, safety technologies, tools, programs, and systems. The bill directs FMCSA to convene a task force to make recommendations for a graduated CDL pilot program for drivers 19 1/2 to 21 years of age between states that enter into bi-state agreements to allow such drivers to cross state lines. Pilot program restrictions would include provisions that: participants must at all times be accompanied by an experienced driver over the age of 21; limits on driving distance and hours; mandatory training beyond that required for other truck drivers; mandatory use of appropriate technology; and a prohibition on hauling hazmat or operating special configurations (e.g., doubles). No more than six bi-state agreements would be permitted and only 10 carriers would be permitted to participate in each. The bill directs the Department of Health and Human Services (HHS) to, within one year, establish standards for the use of hair testing in federal testing programs (e.g., DOT mandatory testing). Then, motor carriers would be permitted to conduct hair tests (in lieu of urine tests) for pre-employment and random testing (note: random hair tests could only be conducted on drivers who had been subject to pre-employment hair tests). The bill would require that every five years FMCSA conduct a review of its existing regulations to determine if they are consistent, clear, current with operational realities of the industry, uniformly enforced, and necessary. Within two years of each review, FMCSA must conduct a rulemaking to address identified deficiencies. Before promulgating new regulations, FMCSA would be required to issue an advance notice of proposed rulemaking to gather data or to conduct a negotiated rulemaking. Finally, all regulatory impact analyses conducted to support new rules must consider impacts on different industry segments and carriers of all sizes. The bill would require that the DOT Inspector General submit a report on the average delay time for loading and unloading commercial motor vehicles and the impact of these delays on the economy, efficiency, safety and driver wages. DOT would also be required to conduct a rulemaking to gather additional data on such delays.